Challah and how it is made has always had a mystique to me. 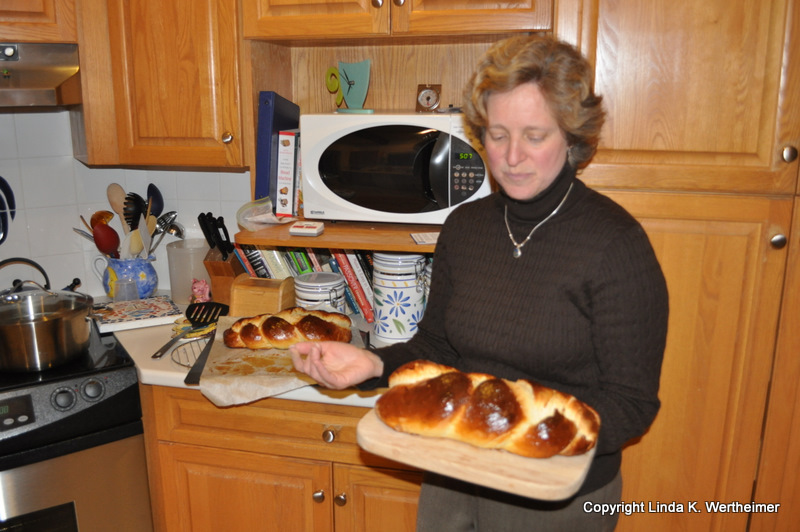 Raised in a non-observant Jewish household, I never saw anyone make the golden, braided bread. As an adult, I bought it often, figuring baking a loaf of challah was beyond my reach. This year, as a secular New Year’s resolution, I made a vow I had avoided for years: I would learn how to make challah. The New Year is just a few months old, and I have made challah, not once, but twice. 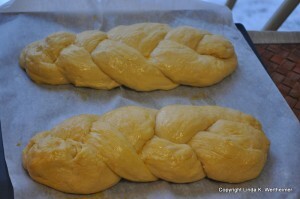 Making challah, I now know, is not so much about the end product. It is about the joy and at times, the cracks, in the process. Challah Baking Part 1: Laura gathers me and her 6-year-old son, Benjamin, in their Culver City, Calif., kitchen on New Year’s Day. Following a Joan Nathan recipe, aptly titled Best Challah, we dissolved yeast and sugar in warm water. Benjamin, a long-time challah-baking assistant, banged eggs slightly against a bowl, and I finished the cracking as we mixed the eggs with the yeast. Skipping some ingredients to avoid boring you with too much minute detail. 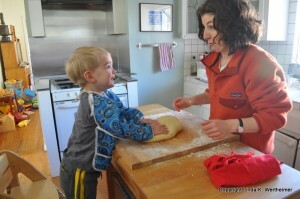 Benjamin and I kneaded the dough, then my son Simon, almost 3 at the time, joined in. 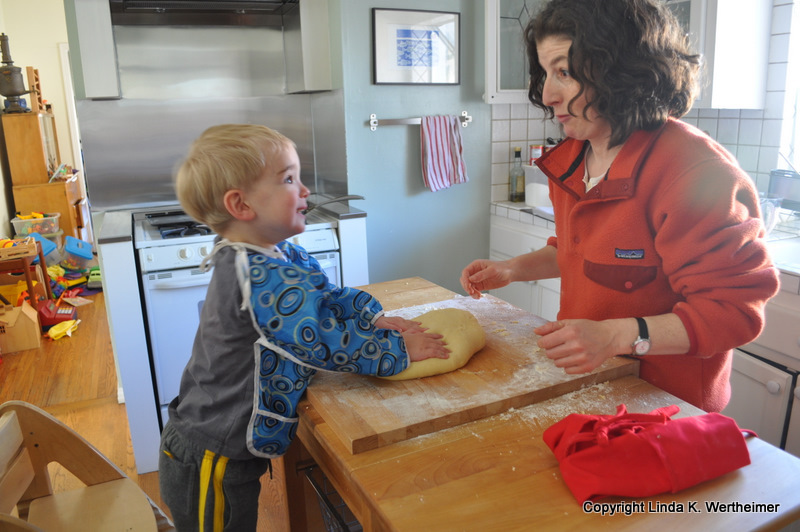 Laura urged Simon to play with the dough as much as he wanted. Poking fingers in the dough? No problem. Hand prints? Sure. Lesson No. 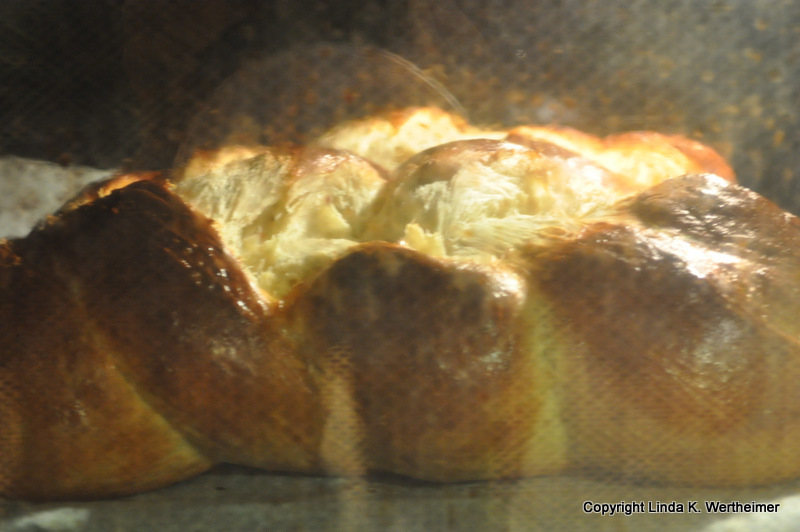 1: Challah baking is not about perfection. It’s about family. The preparation spread throughout the day. While I was out on a walk, my niece Anna, 3, helped with the kneading after the second rise. I returned in time for the braiding. 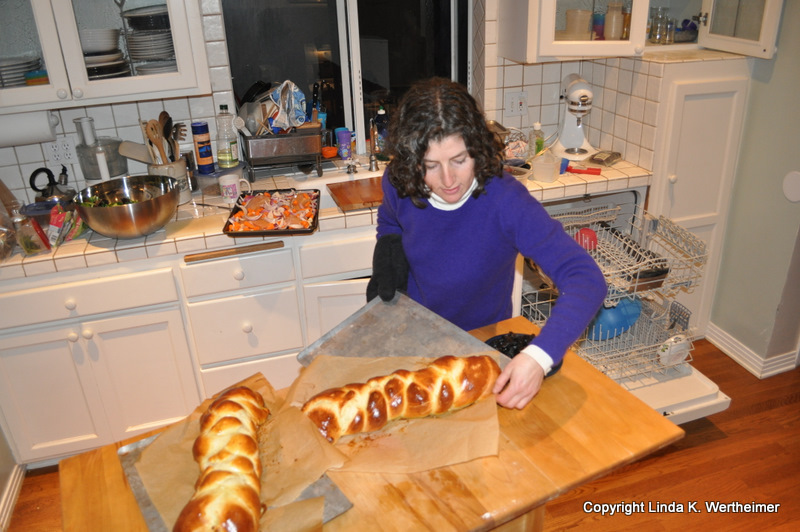 Laura coached, and I twisted and gently pulled strands of dough to form braids. My stomach clenched in apprehension. I had not braided anything since Girl Scout camp when I made lanyards. Laura had written a numerical diagram of how to braid on the recipe. I looked. I fretted. But finally, I conquered. Lesson No. 2: Braiding is only as hard as you make it. “I want a piece. Can I have a piece?” Simon asked when he woke up from his nap and entered the kitchen to see two braided challahs sitting on the counter. It was the loaves’ final rise. He, Benjamin, and I took turns basting the loaves with an egg wash. Lesson No. 3: Children learn patience. 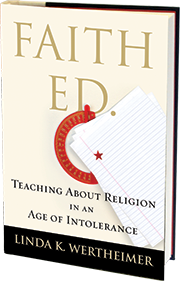 At dinner that night, the warm challah is placed in front of us. The children get the first pieces. By dinner’s end, one loaf is gone. Lesson No. 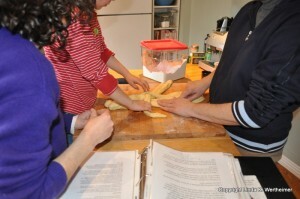 4: Nothing tastes better than challah made together as a family. On a snowy day in our suburban Boston home, I followed the recipe we used in California. The missing ingredients: my sister-in-law, niece, and nephew as guide and assistants. Making my first challah on my own was like auditioning for a play. My stomach fluttered with familiar butterflies. What if I screwed up? What if I wasted the little more than a half dozen cups of flour? What if the bread burned? I drank a glass of Diet Coke. I mixed ingredients and finally, breathed. The butterflies disappeared as I reached the kneading stage. I could hear Simon giggling as he watched Clifford the Big Red Dog on television in our family room. He occasionally came upstairs to see what I was doing. I squeezed the dough over and over. My fingers grew gritty and sticky. “Knead until smooth,” the recipe said. I kneaded again and again. The dough no longer stuck to my hands. I hummed Shabbat songs. I was in the challah-making zone. I was so excited that I posted a note on Facebook announcing that I was almost done making my first challah. Suggestions about enhancing the recipe poured in. The butterflies crept back. It was too late, though, to add vanilla, too late to buy a bigger bread machine to do the kneading. I relaxed. This, for better or worse, would be the challah I made. Lesson No. 5: Stay off Facebook while making challah. I braided with three strands, choosing not to try a six-strand braid. I needed my sister-in-law for that challenge. Simon made an appearance to help with egg washing before the final rise. Excited at least by the appearance of the unbaked loaves, I took photos. Before baking, they looked beautiful. Lesson No. 6: Don’t judge a challah until it comes out of the oven. The bread in the oven, I waited then watched. I turned the oven light on about halfway through the baking. Yikes. The loaves were splitting. My husband, a veteran bread baker, had me walk through the steps I had taken. Did I carefully measure the yeast, using a knife to clear excess off the measuring spoon? Uh, no. How about the oven temperature? Could it be too hot? No idea. Lesson No. 7: Precision is key. The aroma of baking bread filled our home. It smelled a tad off. The bread was not burned, but it was a little more done than the loaves I baked with my sister-in-law. Still, I smiled when I took the loaves out of the oven. They had split – but not as much as I had feared. They looked beautiful, a little more brown than golden yellow. But beautiful. This was my solo run. It was the beginning of something. Then Satisfaction. My First Challah. Final Lesson: Shabbat comes every week. So does the chance to bake a challah. Tagged Challah, family, Judaism. Bookmark the permalink. Thank you. 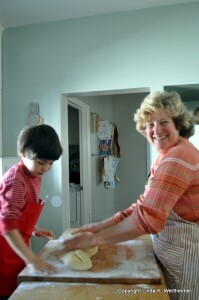 It is amazing what can happen when we simply spend time with family making a little bread. This was absolutely charming and touching to read. Thank you for sharing. Thanks, Jennifer. My journey with challah-making is just starting, and I suspect it will become even more of a family thing as our son gets older. This is encouraging. Like you (before this year), I have never made challah. Both yeast and kneading seem scary. Like something you need magical knowledge to do right. But now maybe I will try it! Thanks for your comment. I definitely made beginner errors, as you can tell from my blog post. I did not measure the yeast to the T – meaning using a knife to make sure it’s totally even on the measuring spoon. The kneading, though, was fun, relaxing, and even a beginner can easily tell when the dough is smooth. The best part, of course, doing this with family. I am writing my monthly mitzvah note to share with colleagues and clergy I know and this month my theme is making challah, since I have been making the same recipe for nearly 20 years since I first got it in college. Can I share it with you too? It is EASY!!!! No kneading necessary. Really. I can send it to you separately if you’d like to post it yourself. I have given this recipe out so many times that I keep a xeroxed copy on hand. It was originally from a kosher bakery in San Diego though I don’t think I ever knew their name. Good for your for beginning this custom. It is one of the most delicious and fun things to do with and for your family on Shabbat! 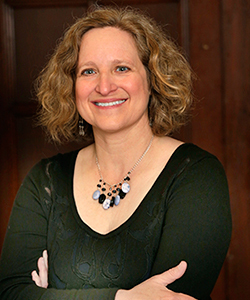 Linda, by all means, please share your recipe for my blog readers!